Casino news | ICE Daily day two edition ready to read! ICE Daily day two edition ready to read! 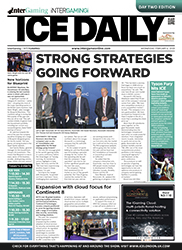 ICE 2019 continues in earnest and once more the day’s breaking news will be carried in the industry’s leading show daily. The day two edition is now available in digital format, viewable directly from your smartphone, tablet, Mac or PC. To view the ICE Daily, please click here. The second day’s edition leads with the news from Novomatic’s announcements from yesterday. It also features the latest entrance to the B1 market from Blueprint and Tyson Fury, of course! Recap the rest of yesterday’s stories with all the usual details of show reveals and announcements from the gaming and igaming industry’s biggest players, including BBIN, Betradar, Kambi, Habanero and BetConstruct.